Re: Outage in Epping, NSW? Hi thanks, this is debatable. This 100MB cable service is a premium service compared to what I was paying before like $50 for **bleep**ty 2MB adsl. I had to budget extra for this by decommisioning my collocated server and moving it to Amazon. I'm a sole trader that works from home and my monthly income is dependant how much work I get, and ADSL is out of the question because how bad the copper lines are in my area and how much trouble is caused me in the past as noted above. Nobody should expect someone to be going from 100MB internet back to 2MB internet right ? . This is not my fault there is no optic fibre yet or a reasonably affordable 100MB business cable internet service. As soon as the NBN is available I will be getting off this anyway. I understand it's a consumer service and I need it for other things than just facebook but still, people pay for the service it's should be fixed fully in a reasonable amount of time, not ongoing problems for like nearly a year now. It caused me 3 months of grief as soon as I joined cable from ADSL, and I had 6 months credited because of this and all the phone data I had to pay. I'm back on the phone data again via the S3 wireless tethering because the mobile broadband stick that was supposed to work and be activated is not, so quite annoying, anyway this would be cheaper than the prepaid mobile broadband. Here it gain again... 30 percent loss. UPDATE: just have had a live chat session and they told to call Faults athrive chat personnel has only limited support functions. And yes, they suggested to reboot the modem before as usual. Hi guys it looks like because of the packets dropping the form post timed out with the server. My observation is it becomes flakey around 6pm - 6am. I got a few dropped packets earlier today but then consistantly was getting none. And then the trouble started again around 6pm, and my dropbox sync was failing and skype was awful again. I had a very important skype call yesterday and I kept dropping out. So basically here is my requirements for internet, I just need working internet where I'm not disconnected for days or timing out like this. I use skype 100% of my time, and dropbox for syncing very large files for audio projects with other colleagues remotely. I'm also a developer in the area of online streaming video so the less latency the better for helping me test things properly. I understand things go wrong all the time that's life, but they really should be addressesed in a fashionable anount of time by hiring more contractors perhaps instead of being tight with money, laying off staff to pay your shareholders more dividends. It should not be stuffing up your paying customers , or else why should we be paying at all ???? I had a good run of 8 months with no troubles perhaps a few wierd offline issues, but the problem has come back big time ! And murphy's law while I really need it the most during a project im doing ! Whoever decided to use copper for internet should be ashamed with themselves hehe. latest ping test. right now the connection is unusable and trying to sync a large file to the dropbox voa my phone data which is going to cost a fortune. A little light humour, lol. (d) other services we may advise to you from time to time. It goes on to say that you may not be able to do these things all the time. lol ben , agreed go "help" other people, i'm waiting for a response via a tech who contacted me via the form. Stop being lip service because it will only embarrass you even more. What year is this? telnet and gopher services lol, it's obviouslly not been updated in decades. I get the point, though we all equally share the same service, we are all here experiencing the same problem, and we are all paying customers, so if we are unable to use the service properly at anytime why should we pay for it ?? Why should I even be wasting my hours even reporting the problems, and trying to find work arounds,it should just work we shouldn't even have to know how things work. I suggest it's a design flaw because some device could have been setup on the line to keep checking on it's health, report the problem immediately and have the issue resolved without us wasting our own time and obviouslly it's a half baked setup and that is not the case. Just to give you an idea the modem reboot helps temporarily, then the problem will start again. It's now not doing it and I have stuff working again so for 6 hours it was dead from 6pm - 12am, as I work nights this is when I need it the most ! That file is still uploading and the status hasn't changed so uploading is still bad. - streaming media, HD streaming if the files are served locally more and more CDN's are locating themselves in sydney, most video is bad in australia because it's all served in america, so your 100MB internet isn't going to do much, the latency and route is bad to begin with. Our household spends $18 a month on landlines, I don't even use the landline. I mostly speak with people I am working with or friends and family via skype, and send files for projects I am working on with people remotely via dropbox and other means. More and more people are working together remotely via the internet this is where it's all going anyway. I rarely use the mobile unless I am meeting up with people, I pay $9 a month for my plan. I rarely use mobile data for internet or video streaming because it's outragously expensive, uneconomical because it's a second internet plan and I have my laptop and a cable connection for those things. The stats in regards to tablets and mobile data is either fudged or people will end up realising how corruptly expensive it is and get out of it or it's actually tablet use via their home internet hehe. I rarely watch tv also. So in my view landline phones and tv are reundant to me and mobile is just there when I need it so I don't need anything specific there and definitely not buying into scammy 4G or any of that. I got my S3 phone and only got the 3G because thats all I ever need. Mobile data is second rate I think, and the faster people push it requiring more towers is only going to make society sicker which it already is, it would be much safer to just stick to fibre optics Apple for instance I can see also trying to make ethernet redundant over wireless, where wireless is terrible and harmful and will never replace a cable ! If i'm going to be pigeon holed as a minority, I'm still a paying customer so who cares how I need to use it ????? As long as the thing stays up ! Can we please keep this stuff about T&Cs out of this thread? It doesn't help any of us who have a broken service. Ben_F may be legally correct but honestly it doesn't actually help anyone here. If I were less generous I'd say that you're simply riling folks up for sport, aka trolling. If you live in the Epping area and have similar issues to what is being reported here please share your experiences. Or if your service is perfectly fine that would be handy to know too. If you can actually help in resolving the issues, please pipe up. Otherwise, this thread is not for you. My aim is to help people to understand what they are paying for and what they should expect as part of that service. Anything streaming, any minimum speed requirement, SSH, Github etc is NOT something to which you are entitled to and if they don't work you aren't entitled to have them fixed. packet loss again, and it's delaying me. 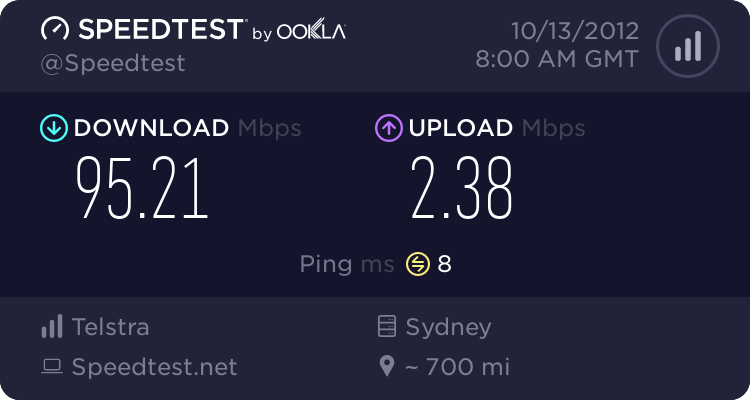 Uploads are completely buggered up , speedtest.net won't even initiate the upload test, dropbox has failed to upload an important file all day. Skype is also patchy of course. Electroteque, Shelly is current accross your issue and will be in contact with you later today once she has completed her investigations. Apmdimka, I've sent you a PM with our online form (which i'm sure you've seen posted here). Send me through your details and I'll have a look into your connection as well. Stop trolling this thread, we got your point. Technically streaming and Dropbox are HTTP-based so they count as web downloads/uploads. Guys, I have called tech support and they logged the issue. They promised to send me the technician on Wed (I do not really know why I need him/her). They were also confirmed that my connection (as well as others') was flaky. Just a quick note to let you know that I have passed this information on to our network team, and I will advise as I receive any updates. We have just gotten word from the Network guys that an outage is (once-again) listed for Epping. We are currently working on getting the packet loss issue resolved. Hi everyone, It looks like this thread is getting a little off topic. Brodie and Shelly from Tech Support are looking into this and have responded to this issue(s). Please keep an eye on this thread for more updates from them. Things improved considerably since I was told it was being looked at and fixed by Monday. Hopefully it stays this way. Looking good for me too. latency on my ping times is a bit concerning though, not always 8ms. I hope it stays up ! I was hoping it was the modem so I could get it replaced with something better and the wireless is unstable at times. I still have failed to find the time to find a suitable Soho router I could bridge that will actually work like my Billion one as the routing options on this netgear is useless and there is zero in terms of security features because apparantly "home" users don't need security ???? I despise consumer grade products hehe. Ouch this is going to hurt , my $9 a month mobile phone bill has become $119 due to the excess data to get a file transferred the other day I couldnt even get the backup broadband stick I was given working because no drivers for mountain lion. It's great to hear that your services are back up and running. At this stage I can advise that some network equipment was replaced which was affecting several hubs in the area. Hi Shelly ive been extremely busy the past 2 weeks how do I go about getting credit for my downtime. If you contact our accounts team on 13 22 00, they will be happy to discuss that with you. Yep. 20-50% packet loss since 2:30pm Friday 29 March. Has anyone in the Epping area been experiencing (cable) dropouts lately? I'm trying to figure out if there's an issue with my modem or there is maybe a problem in the area with the cable headend. I have experienced regular dropouts for the past month or two. Sometimes the modem has rebooted itself, other times it's just a dropout & modem is online but has resynced. Today my modem dropped out, then when it resynced it could only see a single upstream channel, and a single downstream channel (normally I would see 8). The "online" light on the modem was flashing, and the "Network Access" item on the Gateway Status page said "Access denied". There was a similar "Access denied" message on the Gateway Status page. I rang Telstra and the CSR was very helpful. We went through all the diagnostics quickly, including a factory reset of my modem but we could never get past the flashing online light & "Access denied" messages. She also checked that there were no reported outages in this area (on 3! systems). In the end she scheduled a technician visit for tomorrow. My modem has since been able to sync and I'm back online... so I'm now trying to figure out whether there was a problem on the cable node end that was fixed, or whether my modem is actually on the fritz. I can see that there have been issues in Epping NSW over the past few days for BigPond Cable and Foxtel services. These are currently resolved. Please check our Service Status page http://servicestatus.telstra.com/ to check for any current issues, and if none are listed, please contact Tech Support on 133 933 so that this can be escalated. As fault reports lodged create a pattern, these are used to identify network issues affecting performance. Unfortunately the Bigpond person I spoke to, who was very helpful, said she checked all 3 systems she had access to and there were no faults in this area! Anyway I ended up cancelling the technician visit last night as my service seemed fine. Is there a way to see past outages even if they are fixed? It would be very helpful to be able to correlate my own logs with past outages so I could separate possible issues with my specific service (wiring, modem) vs broader cable issues. I've been experiencing quite a few dropouts lately. A few last night, and a few again tonight. It seems that the modem is maybe losing sync (not sure on the right term). I notice each time it drops out and reconnects that the frequency on the connection page has changed. Anyone else in the area experiencing this? Our tech experts have gone home for the weekend and wont be in over the easter break so I would suggest that your best course of action is to speak to tech support to report the issue. I will flag this post with the tech team also and request they respond next week. I'm having consistent dropped packets, in my experience it will keep getting worse until full disconnection. It regularly does this though they are warning signs but has now decided to completely fall over and now we're without internet for days because nobody is around. This is incredible. What "upgrade" was done the other day ? It falls over especially when it rains I would never expect it to hold up with more people joining it. What is strange is the modem is sometimes inaccessible while its doing this its somehow rebooting itself at times so the interface is not accessible but the uptime says 30days here. I have it in bridge mode also. Today its accessible but still dropped packets and timing out. Is those logs in the modem got anything to do with a crap signal ? I bet our problems from years ago were never resolved. Every few months it will go down like this really and randomly within that. Fibre will give us 100% uptime so what is the issue with that ! To clarify the upgrade that we did to our systems last weekend was to our internal billing systems, this has nothing to do with service delivery or your experience with on the network itself. As mentioned in my post above I will flag this for tech on Tuesday, however you would be well advised to speak to technical support in the meantime if you would like this looked at sooner. actually I made quite a few posts in the past few months but nobody bothered to resolve it. Calling the centre for this is useless they prob wouldn't even know what a dropped packet is LOL. We need to speak to a tech. It's going on for too long. this timed out trying again lol. third time lucky dropped packets increasing until complete fall over i am well acquanted with this nightmare ! danrossi: Having dealt with many utterly useless Telstra staff I sympathise with your predicament but the only hope you have is to go through the calls, scripts, and tech visits so they can rule out issues with your wiring and escalate further if need be. Don't know what the situation is today but in the past when I've had issues I've had most success with folks from the 24x7 / social media team which includes some (all?) of the staff on here. In my experience the good staffers will own your case and follow up until its resolved -- I had Brodie call me back almost every day to check on the status of things the last time I had major issues. The reason this thread exists isn't so much to report individual service issues but to attempt to correlate problems across services within the Epping (NSW, 2121) area. This was helpful in the past to work out that there was some problem upstream and not issues specific to my (and a few other local residents') service, when the service status page consistently showed no issues in the area. It's working again now. But another test will show up 3%. This kind of thing happens all the time and enough to send you crazy. This will never happen on fibre ! I believe I have had noise problems since day 1 as displayed at the start of this thread and will never go away. My modem logs may explain that perhaps ? Please advise as I had no replies on my other question about this. There is no modem logs producing those results as yet though. Hi Team FYI after 6pm again and no dropped packets but the modem decided to be complete unresponsive and the connection completely cutout without warning so the dropped packets are warning signs for huge connection tsunamis ! . We are the first people with the original modems which has never had a firmware upgrade ever so before we can tell the usual noisy line is at fault we may need a new modem. I've reported this problem many times already. The internet will completely cut out and logging into the bridge ip 192.168.100.1 to see whats going on is impossible because the modem interface is unresponsive and i cant ping to it. It seems this happens whenever there is indeed a line problem sometimes which is just bizarre. Last night it was dropping packets but the interface was up. I rebooted it but was failing to connect for 20 mins another reboot and another 10 mins later it connected. May i ask is this a connection issue with too many users because its happening at the same times at night now. It's not right we're subjected to this constantly and it's time consuming to deal with this ! . Fair enough it was a new network a few years ago but for it to happen still is crap. these are my modem logs. It would be nice to get a new modem to rule out this crappy one is a problem. I just had to reboot it. I've lost count how many times I've reported this now and it's clearly faulty because the firmware is not maintained and we can't maintain it ourselves because it's locked down. Please advise. That might be the first measure in reduction debugging. I believe it has something to do with the log messages. This has always been like this from day one. Apologies, our tech team are not able to get help today, I will follow up with them tomorrow. The modem just became unresponsive again requiring a reboot. I cannot log into it to see what is going on. This is happening daily now since last week when it was dropping packets before that it was random now its daily. I would be good to get a brand new modem to rule that out. Usually when modems become unresponsive it can indicate modem failure. Have you completed a factory default? Can you trial the service without bridging? Anyone in the Epping, NSW area that has paid for "Super Fast" Cable upgrade (100Mbps) but recently found themselves on a ~30Mbps speed cap? Longer version: I've been a Cable Ultimate (100Mbps) customer for over 2 years. Recently changed to Telstra Pinnacle Bundle. In theory that should mean no speed change on my service as the Pinnacle Bundle includes the "Super Fast" speed pack. Today I notice my service seems to be maxed out at 36Mbps downstream, 1Mbps upstream. http://www.speedtest.net/my-result/3493521178 (I've run this multiple times, with no other traffic at the time). I tend to transfer a lot of large files between home and remote hosts that I control, and in the past have always been able to saturate my cable with 11+MB/s (megabytes per second, so ~100Mbps). Today, no matter how many connections I use, the cable seems to peak at that 36Mbps figure. On the upload side I used to get 1.7Mbps upstream (out of the advertised 2.4Mbps) but am now limited to ~1.1Mbps upstream. It looks remarkably like someone accidentally stuck the old 30/1Mbps profile on my service. I've spoken to 4 different Telstra staff today - bounced between Tech Support -> Accounts -> Tech Support, with the 4th person on the "recovery" Live Chat blaming it on scheduled maintenance in my area. I can't seem to get a straight story hence I wonder if it is maintenance whether others in this area who are supposed to be on 100Mbps are finding themselves artificially capped at ~36Mbps? I certainly agree that the most likely scenario here seems to be that the speed boost was accidentally removed from your service upon the Bundle change. But it's a bit concerning that you've contacted us to check in on this and nothing has been done. I'll be in touch shortly via private message. Just wanted to publicly say a big thank you to Ben_J. The issue was as we suspected -- I'd been put on the wrong plan. Ben_J was able to fix that up and I'm back at 100Mbps now (after a reset of my modem). Thats really bad no I just did a speedtest and this is what I get mind you I bridge to an edgemax router hence the values are higher than I normally would using the dodgy router in the modem. There was an odd delay hence the ping time is worse than normal but no packet loss like we experienced a few weeks ago. Brodie unfortunately it has nothing to do with my router the modem becomes completely unresponsive and I can't ping to it or bring up it's web interface. At this moment I can't access my connection. I can't just fallback to the other router in the modem and wait for it to happen again as then I'm exposed because it's insecure and lose my firewall setup. I believe it's faulty I just had to reboot again and wait 5 minutes for it to reconnect. This is what I get in my logs can anyone figure out the fault from this ? Please help it's getting frustrating and i'm afraid I have no time to keep coming in here to check on an update and it's taking a while to resolve this. Can anyone decipher the issue according to those logs ? This is ongoing I need a new device and can't BYO or else I would have e-waste this and got a new one.